To Hilbre, once again, for more photography adventures. Can't keep me off those rocks at the moment. My good buddy John and I were on the island last Monday doing what we could to ensure the smooth running of a natural history photography course. 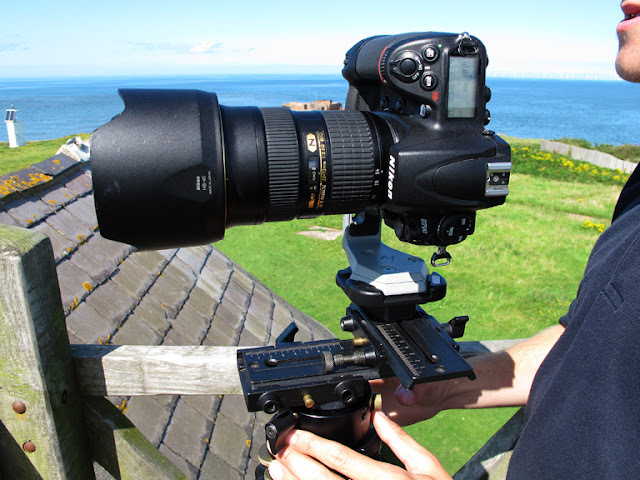 While we were there we had the opportunity of learning a little bit about creating panoramic images, and there could be nowhere better than Hilbre to start our education. We took several sequences at two locations, then once the images were in the bag we learned how to construct the final picture using Photoshop. later that evening from my scribbled notes I managed to produce a couple of panoramas I was happy with. My favourite was one taken on the south of the island looking west. 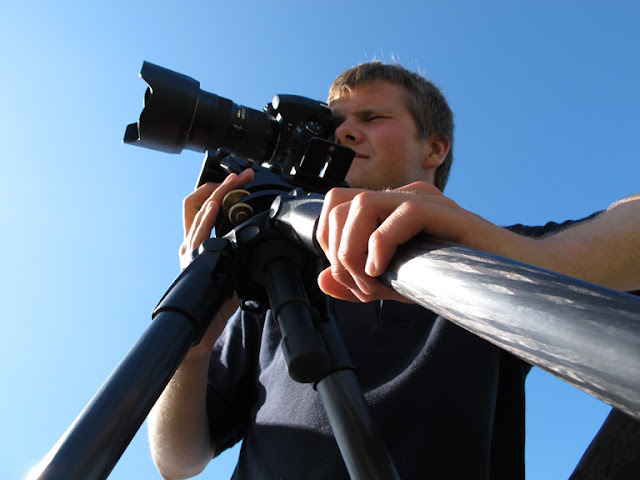 It also captured a chap called Paul who was doing a time lapse sequence of the rising/falling tide. All kinds of photography projects had been going on around the islands.... brilliant! After we had finished ascending our steep learning curve I turned my attention to our back to more familiar subjects - wading birds - and in particular Turnstones. These birds can get a little overlooked for the more unusal species that visit the Dee, but I do have a soft spot for them and I spent a happy half hour watching them going about their business around the old lifeboat slipway. 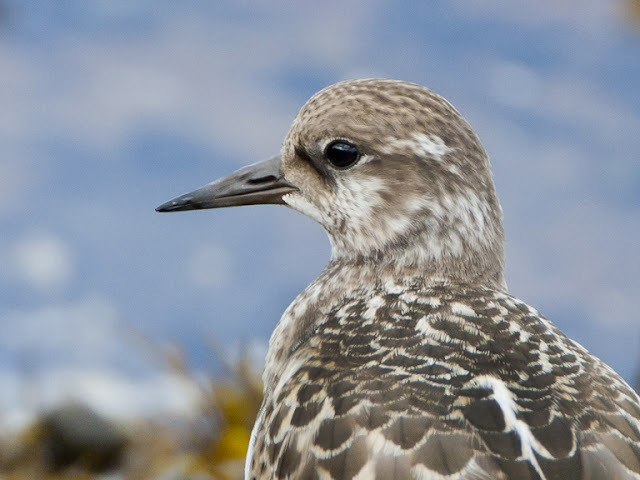 One adult, fresh in from spending the past few weeks in the high arctic, was washing in a recently tide-refreshed rock pool as some juveniles wandered the sandstone reefs looking for food. 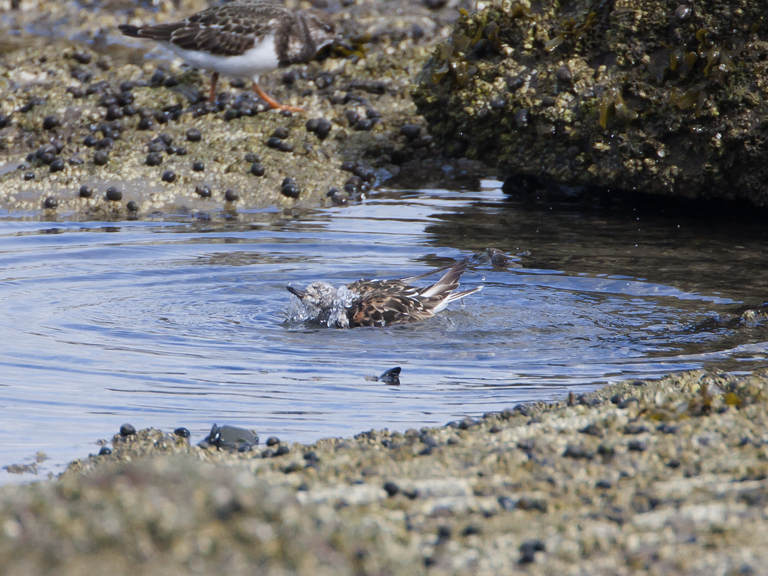 The birds were finding and eating lots of small crabs. I considered this behaviour while I recorded it. Were these crabs ideal high energy snacks to refuel after the long journey south? Do young crabs have softer shells making them easy to eat? Could it be that there were just lots of crabs around? Whatever the reason, the birds are getting stuck into them. Their ability to locate the crabs in the seaweed was matched only by their dexterity in picking them out. 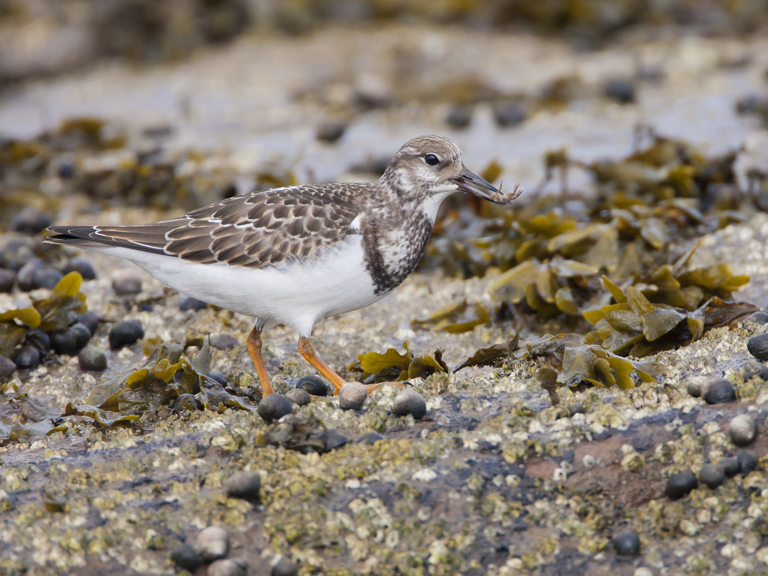 It was a little gruesome to see the flailing claws as the helpless crustaceans disappeared down the throats of the hungry Turnstones. Crabs are certainly the most popular dish on the menu today at this seaside fly thru restaurant, dozens of them being dispatched by the birds as they trotted about the rocks. A dash, a pause, a peck then a gulp. Another order for the Hilbre Crab Shack. Just a bit of info about crabs. About three or four times a year they shed their shells as they grow a new one underneath. Just after they have she'd their old shell, their new one won't have hardened up yet and so the crab is very soft. 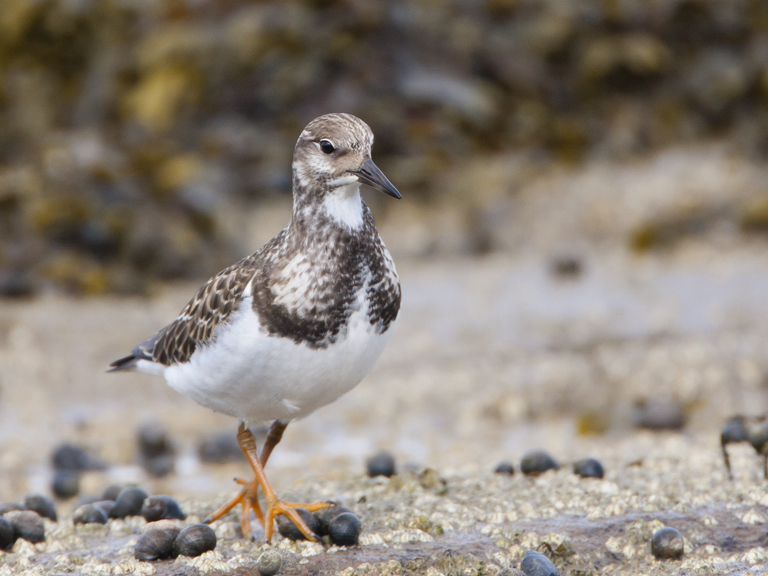 These Turnstones may have been taking advantage of a big crab peeling surge.